Otte, T. G. 2016. Joseph Chamberlain. p. 17. Cullinane, Michael Patrick 2016. THEODORE ROOSEVELT IN THE EYES OF THE ALLIES. The Journal of the Gilded Age and Progressive Era, Vol. 15, Issue. 01, p. 80. 2005. Auf ewig Feind?. p. 413. 1 Keynes, J. M., Essays in biography (London, 1951 edn), pp. 32–3. 2 Burrow, J. W., A Liberal descent, Victorian historians and the English past (Cambridge 1983), pp. 116–22. 3 For a good general account, see Fry, Michael G., Lloyd George and foreign policy, I (Montreal, 1977). 4 His Who's who entry said of Dawson, , ‘Most of his books have been written for the purpose of interpreting German thought, life and character to English people, and particularly of expounding German practice in the treatment of social and industrial questions…’. 5 Harold, Spender, The fire of life (London, n.d.), pp. 161–6. At Carlsbad, Lloyd George met Clemenceau for the first time. 6 Pari. Deb., 5th ser., XXV, 615–16 (4 May 1911). 7 Lloyd George was in touch with Theodore Roosevelt during the 1912 presidential campaign, cf. D. Lloyd George to Mrs Lloyd George, 16 Oct. 1912, in Morgan, Kenneth O. (ed. ), Lloyd George: family letters, c. 1885–1936 (Oxford and Cardiff, 1973), p. 164. 8 Fair, John D., Interplay conferences (Oxford, 1980), pp. 91ff. 9 George, D. Lloyd, The truth about the peace treaties, I (London, 1938), 231–2. 10 Pari. Deb., 5th ser., XXV, 615–16, 638 (4 May 1911). See Hennock, E. P., British social reform and German precedents. The case of social insurance 1880–1914 (Oxford, 1987), pp. 180ff. 11 George, D. Lloyd, War memoirs (London, 1938), I, 8–16 (with the Kaiser's annotations included). 13 Taylor, A. J. P., The struggle for mastery in Europe, 1848–1918 (Oxford, 1954), p. 471. 14 There is a good discussion in Gilbert, Bentley Brinkerhoff, David Lloyd George, I. Organizer of victory, 1912–1916, (Columbus, Ohio, 1992), pp. 74–9. 15 The Times, 18 July 1914. 16 Ibid. 20 Sept. 1914. 17 See Morgan, Kenneth O., ‘Peace movements in Wales, 1899–1945’, Welsh History Review, X, 1 (1981), 406–7. 18 Notably in his interview with Roy Howard of the American United Press, published in The Times, 29 Nov. 1916. 19 Lloyd George's Bangor speech is printed in a volume of his speeches, Through terror to triumph (London, 1915), pp. 75–89. 20 Keynes, J. M., The economic consequences of the peace (London, 1919), pp. 127–33. 21 cf. Morgan, Kenneth O., Consensus and disunity. The Lloyd George coalition government, 1918–1922 (Oxford, 1986 edn), pp. 39–41. 22 Robert, Skidelsky, John Maynard Keynes, Vol. I, 1883–1920 (London 1983), pp. 358–61. 23 Morgan, Kenneth O., ‘Lloyd George's stage army: the coalition Liberals, 1918–22’, in Taylor, A. J. P. (ed. ), Lloyd George: twelve essays (London, 1971), pp. 230–1. Also see H. A. L. Fisher to Lloyd George, 17 March 1919 (House of Lords Record Office, Lloyd George papers, F/16/7/39) in which Fisher warns against either Danzig or Posen being given to Poland. 24 See Lloyd, George, The truth about the peace treaties, I, 259–61. 25 See John, Turner, Lloyd George's secretariat (Cambridge, 1980), pp. 153ff. for Kerr's views. 26 It is printed in its entirety in Lloyd, George'sThe truth about the peace treaties, I, 403–16. 27 Keynes, J. M., The economic consequences of the peace (London, 1919), pp. 186–7. He added that Germany would not be able to pay this amount. 28 Lentin, A., Guilt at Versailles (London, 1985), pp. 101–4. 30 Lloyd, George, The truth about the peace treaties, I, p. 461. 31 ‘An entirely new kind of capitalist, dark and fanatical’: Philip Kerr to Lord Curzon, 25 June 1920 (PRO, FO/800/153), fos. 289–90. 32 For the Genoa conference, see Stephen, White, The origins of detente (Cambridge, 1985). There is an interesting essay on Walter Rathenau in James, Joll, Intellectuals in politics (London, 1960), pp. 59ff. 33 See Lloyd George to Kingsley Martin, 28 March 1936 (House of Lords Record Office, Lloyd George papers, G/14/2/3). 34 Lloyd, George, The truth about the peace treaties, II, 930ff. 35 For this visit, see Thomas, Jones, A diary with letters, 1931–50 (Oxford, 1954), pp. 239–42, and Ellis, E. L., T. J. A life of Dr Thomas Jones CH (Cardiff, 1992), pp. 405–8, along with the pamphlet by Emrys, Pride, Why Lloyd George met Hitler (Newport, 1981). 36 Daily Express, 17 Sept. 1936. 37 Colin, Cross (ed. 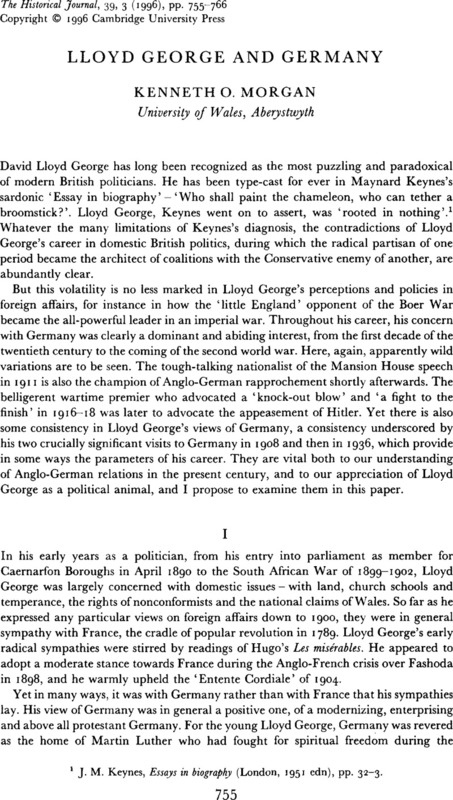 ), A. J. Sylvester: life with Lloyd George (London, 1975), p. 219 (5 Oct. 1938). See also Parker, R. A. C., Chamberlain and appeasement (London, 1993), pp. 315–16. 38 See on this phase, Sidney, Aster, ‘Ivan Maisky and parliamentary anti-appeasement, 1938–9’, in Taylor, A. J. P. (ed. ), Lloyd George: twelve essays, pp. 317ff. Maisky's estimation of Lloyd George dated from the moderate policy towards the Soviet Union that the British prime minister inaugurated in 1920–1. On his eightieth birthday in 1943, Lloyd George was told by Maisky ‘… in my estimation you are probably the outstanding statesman Great Britain has produced throughout his period’. 39 See Paul, Addison, ‘Lloyd George and a compromise peace in the second world war’, in Taylor, A. J . P. (ed. ), Twelve essays, p. 361ff. 40 ‘Special Mission to Europe of Sumner Welles’, Foreign relations of the United States, Diplomatic papers, 1940 (Washington), pp. 85–6. 41 Taylor, A. J. P. (ed. ), Lloyd George, a diary by Frances Stevenson (London, 1971), pp. 256–7 (21 02 1934) ‘We should keep a strong hand in India’, observed Lloyd George. Also ibid. pp. 272–3 (14 May 1934).